Dial plans are all about how incoming calls are routed (call flow). For example, when someone calls, does it ring a receptionist first or go directly to an auto attendant? Suppose calls are routed to the receptionist, what happens if no one picks up? The visual Dial Plan Editor is an intuitive tool that contains different nodes (dial plan actions) to set up a dial plan for any scenario. Each node’s settings are detailed below. To access the settings for a dial plan, click Dial Plans in the left sidebar and then click a dial plan to launch the editor. Three to six digit number that identifies the dial plan and makes it dialable. Name by which the dial plan is identified. Removes the dial plan from all internal directories. Tip: Click to clone a dial plan. Tip: Click to export a dial plan as a .xml file. This file can then be imported into a different PBX by clicking [IMPORT DIAL PLAN]. Proprietary options, like sound clips, will be removed so only the nodes and connections remain. Routes the caller to a line or ring group for the specified timeout period. After the timeout expires, the call will continue to the next node in the call flow. This node ignores any Find Me/Follow Me settings that may be set up on an individual line. The line or ring group must be created outside the editor before it can be added to the node. Select the line or ring group that will ring. Enter the time (in seconds) that the line or ring group will ring before going to the next node in the call flow. The default timeout is 20 seconds. Connects nodes together to create a call flow. Drag and drop the target on the next node in the dial plan. Disconnected targets will hang up on the caller at that point in the dial plan. Routes the caller to a specified line where the user’s Find Me/Follow Me settings are followed. If the user has not set up their Find Me/Follow Me settings, the line will ring for 20 seconds and then go to voicemail. The line must be created outside the editor before it can be added to the node. Select the line that will ring. Routes the caller to an external phone number (local, long-distance, or international). Enter the external phone number (local, long-distance, or international) to which the call will be forwarded. 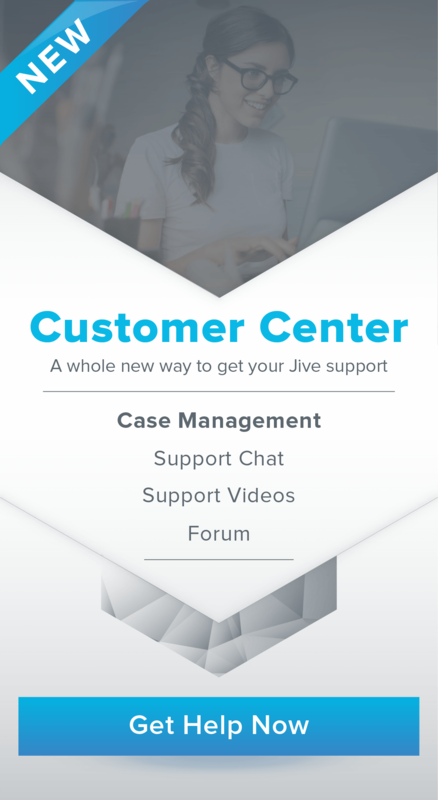 Pseudo area codes (999, 555, and 400) can be used to accommodate dial plans that integrate with Jive Contact Center Pro. To use pseudo area codes, your region must be set to United State or Canada. Enter the time (in seconds) that the external phone number will ring before going to the next node in the call flow. The default timeout is 20 seconds. If enabled, the system provides the option to dial 1 to accept an incoming call or 2 to send it to voicemail. The primary benefit of this feature is when a cell phone is in a ring step. When a cell phone is turned off or out of range, calls usually go straight to the cell phone voicemail box. Without confirm pickup, the voicemail would answer the call and prematurely end the dial plan. Enabling confirm pickup allows the call to re-route back to the next ring step or to the Jive voicemail box. A secondary benefit is if calls are being routed to a personal phone number. Having confirm pickup enabled lets the user know the call is business related, and they can then answer the call appropriately. Controls what is shown on the caller ID. If enabled, the caller ID of the original caller is displayed. Disabled, the caller ID shows the number selected for the node (see below). Note: This feature does not work if Block Caller ID is enabled on the phone number used to dial the external number. Select which caller ID is shown when Pass Thru Caller ID is unchecked. Connects nodes together to create a call flow. Drag and drop the red target on the next node in the dial plan. Disconnected targets will hang up on the caller at that point in the dial plan. Routes the caller to the designated voicemail box (user-specific or shared). If a user-specific line is set up to a shared voicemail box as its alternate mailbox, this node will still route the caller to the user-specific voicemail box, NOT the shared voicemail box. The only way to route the caller to a shared voicemail box is to select its assigned extension. Select the voicemail box that will be used. Select which type of voicemail greeting will be heard before the caller leaves a message. Busy: Plays the user’s busy message. Unavailable: Plays the user’s unavailable message. No Greeting: No greeting is played. Caller immediately hears the voicemail “beep” and recording begins. Routes the call to the designated virtual fax machine. The virtual fax machine must be created outside the editor before it can be added to the node. Note: This node will end the call flow. If you would like a dial plan to detect a fax tone before going to another step, use the Detect Fax node. Select the virtual fax machine that will be used. Routes the caller to a different call flow based on a defined schedule. The schedule must be created outside the editor before it can be added to the node. Select the schedule that will be used. When the schedule is “open” the caller is routed to the “open call flow”. Drag and drop the target on the next node in the dial plan. Disconnected targets will hang up on the caller when the schedule is open. When the schedule is “closed” the caller is routed to the “closed call flow”. Drag and drop the target on the next node in the dial plan. Disconnected targets will hang up on the caller when the schedule is closed. When the schedule is “on holiday” the caller is routed to the “holiday call flow”. Drag and drop the target on the next node in the dial plan. Disconnected targets will hang up on the caller when the schedule is on holiday. Plays the designated sound clip and then immediately routes the caller to the next step in the call flow. The sound clip must be recorded outside the editor before it can be added to the node. Select the sound clip that will play. Prepends (prefix) the caller ID of the incoming caller and then immediately routes the caller to the next step in the call flow. This prefix displays on the device(s) on which the call rings. For example, if “Sales–” was entered, then a call from “John Smith <801-555-5555>” would appear as “Sales–John Smith <801-555-5555>” on the ringing device(s). Enter the text (limit of 10 characters) that will prepend to the caller ID. ASCII characters are supported. Changes the language of system messages for every subsequent node in the dial plan. Select the language of system messages for every subsequent node. Restricts the caller access to certain paths. In order to advance to the next node, the correct numeric password must be dialed. If the caller dials the incorrect password, the “Access Denied” message will play. Enter the numeric password (numbers only) required to advance to the next node in the dial plan. Restricts the caller access to certain call paths. In order to advance to the next node, the caller must belong to a specific user group. If the caller does not belong to the specified user group, the “Access Denied” message will play. The user group must be created outside the editor before it can be added to the node. Select the user group required to advance to the next node in the dial plan. Inserts a period of silence or ring tone into the call flow. Enter the amount time (in seconds) the caller will hear silence or ring tone before going to the next node in the call flow. If checked, the caller will hear a ringing sound while waiting. Otherwise, the caller will hear only silence. Routes the caller to a different dial plan. This helps segment out dial plans into simple, discrete sections while still allowing for complex call flow setups. Select the dial plan to which the caller will be routed. Terminates the call and hangs up on the caller. Tells the system to listen for a fax tone. If a fax is detected, the call is intercepted and sent to the designated virtual fax machine. The virtual fax machine must be created outside the editor before it can be added to the node. If using this node, please ensure it is placed as the first node in your dial plan. We recommend following this with a wait node set at a minimum of 4 seconds. This node is no longer supported. Plays a recorded sound clip providing dialable options to the caller. Based on the option chosen, the caller will be routed to different call paths. The sound clip must be recorded outside the editor before it can be added to the node. Enter the time (in seconds) that the caller has to select an option before going to the “On timeout go to” call flow (time begins after the sound clip). If checked, the caller can dial (at any time) and be routed to any system extension. Note: A dialed auto attendant option will take precedence over a dialed extension. The caller is routed to this call flow if no option is dialed during the timeout period. Drag and drop the target on the next node in the dial plan. Disconnected targets will hang up on the caller when the timeout duration expires. The caller is routed to this call flow if an invalid option is dialed. Drag and drop the target on the next node in the dial plan. Disconnected targets will hang up on the caller when an invalid option is selected. Enter the dialable codes from which the caller can choose. Dialable codes can be numbers, # (pound), * (star), or any combination. Drag and drop the target on the next node in the dial plan. Disconnected targets will hang up on the caller when the corresponding option is selected. Adds dialable option rows. There is not limit to the number of options that be added. Routes the caller to a call queue. The caller will wait in the queue for the next available agent or until the timeout value expires. The call queue must be created outside the editor before it can be added to the node. Note: The maximum time allowance is 8 hours. Select the call queue that will be used. Enter the time (in seconds) the caller will wait in the call queue for the next available agent. The caller is routed to this call flow if no agents answer the call during the timeout period. Drag and drop the target on the next node in the dial plan. Disconnected targets will hang up on the caller when the timeout duration expires. The caller is routed to this call flow if they dial * (star). Drag and drop the target on the next node in the dial plan. Disconnected targets will hang up on the caller when the caller escapes the call queue. Routes the caller to a conference bridge. The conference bridge must be created outside the editor before it can be added to the node. Select the conference bridge that will be used. Routes the caller to a dial by name directory. The caller is asked to dial their party’s first or last name. Select the directory that will be used. Routes the caller to the voicemail menu. From this menu they can authenticate to the system and access their voicemail box. Authentication settings are set up from the VM/Fax tab within Permissions. This requires third party software. HTTPS is supported. Sends notifications to a remote web server through a URL. This allows an event in a Jive PBX to trigger an action on a remote system. Simply enter a URL in the node, and that URL will be hit with an HTTP POST as calls ‘pass through’. Multiple variables are available and all variables are also included in the post body. Trigger a remote application to generate a “screen pop” notification. Trigger an email/SMS message in real-time. Allow supplemental real-time call logging. CALL_ID = Unique string of characters used to identify the call (In POST Body = Y). CALLER_ID_NAME = Caller’s name (In POST Body = Y). CALLER_ID_NUMBER = Caller’s number (In POST Body = Y). CNAM = Caller’s name (In POST Body = Y). CNUM = Caller’s number (In POST Body = N). DIALED_NUMBER = Number the caller dialed (In POST Body = Y). DNIS = Number the caller dialed (In POST Body = N). PBX_ID = ID of the PBX receiving the call (In POST Body = Y). Enter the URL to be used (limit of 255 characters). This requires third party software. Sends requests to the specified URL address and waits for a command back from that URL identifying the destination extension (used to integrate with third party call management systems). If there is no response from the URL after two seconds, the call will be routed to the next step in the dial plan. If the destination extension is invalid on the PBX, the call will be routed to failover destination for the line. The extension can be given as the extension number (e.g. 1234) or as the extension ID (e.g. 014953cc-025a-c471-8e89-000100620002, the last ID in the URL on the extension’s page). The extension number or ID should be the only text in the response and should not be surrounded by quotes. Route calls to a sales agent based on information in a CRM. Route calls to a support agent that has been working on a ticket with a customer. Route calls based on the area code of a caller. CALL_ID = Unique string of characters used to identify the call. CALLER_ID_NAME = Caller’s name (if available). DIALED_NUMBER = Number the caller dialed. PBX_ID = ID of the PBX reciving the call. Connects nodes together to create a call flow. Drag and drop the target on the next node in the dial plan. Disconnected targets will hang up on the caller when the request fails.